The FMIT Alert Notification System helps Members prepare for impending weather events by providing alert information directly to their inbox and cell phone. FMIT Alerts are timely, brief and packed with the pre-event information, such as projected storm path and intensity data, that Members need to make advanced preparation decisions. 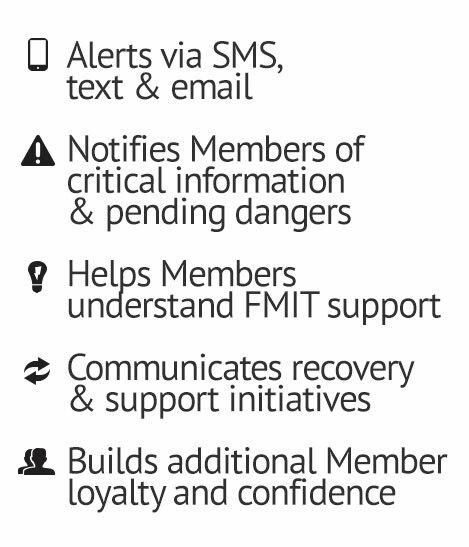 Alerts also include post-event communications delivered via email, phone and text message that support specific FMIT recovery initiatives and the RAPID AssessmentSM Program. Alert notifications delivered via e-mail, phone and text messages.